Friday March 18th 1904 I did churning alone. Will went to town early to see about the wood sawing. he decided to not have it done. I did some writing after dinner and took the letters to the mail box. I stopped at Mrs Kosers to spend the afternoon. Mollie did not go home tonight. I read all evening. Saturday March 19th 1904 I was busy all morning with sweeping and the dinner. I finished Mollies tatting for drawers and we cut there after dinner and went down to Mrs Franklin Pointains where we spent a pleasant afternoon. Did evening work and read the papers. 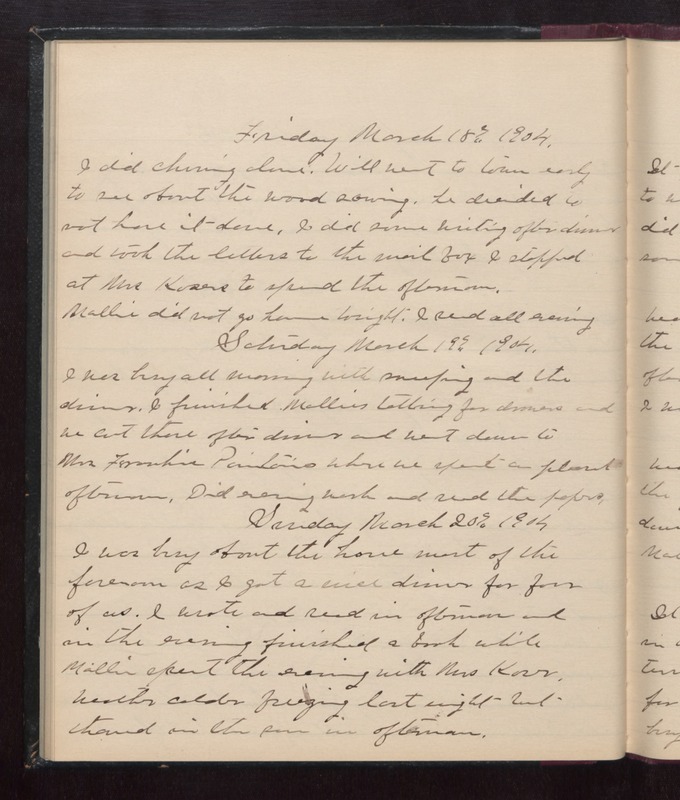 Sunday March 20th 1904 I was busy about the house most of the forenoon as I got a nice dinner for four of us. I wrote and read in afternoon and in the evening finished a book while Mollie spent the evening with Mrs Koser. weather colder freezing last night but thawed in the sun in afternoon.